New Jersey Home Inspections | Atlantic County and Cape May County N. J. Home Inspectors. Congratulations… you’ve found us! Interspec, LLC is South Jersey’s Premier Residential Real Estate Inspection Company with over 2500 completed Home Inspections since 2007. We are a locally owned and operated independent company, NOT A FRANCHISE! Our central location allows us easy access to all shore points from lower Ocean County in the north to the southern most points of Cape May County. Although our extensive knowledge of coastal New Jersey gives us an opportunity to apply our insight of the unique forces effecting homes in coastal towns, we don’t limit our inspections to those areas. We Service all areas in Southern New Jersey including Cumberland County, Gloucester County, Camden County and Burlington County. We provide home inspection solutions for both home buyers and sellers. If you are purchasing a home anywhere in south jersey we can provide you with an unbiased professional inspection detailing the condition of the home. We feel our detailed professionally bound computer generated inspection reports are the best in the business. We also provide our customers with an electronic report in the popular Adobe PDF format via our secure server which can be accessed by your agent or lawyer if requested. We make it easy! If you are selling your home our Pre-Listing Inspection will help you assess the overall condition of the home. This will allow homeowners to make improvements in advanced prior to the buyer’s inspection. Please follow the link above for detailed information. Building or buying a new home? We find many of the problems associated with older homes present in new homes as well. Only a professional home inspector will find many of these issues. Please don't assume that because the property is new it is free of defects. Our home inspections follow the strict standards provided by The State of New Jersey Board of Professional Engineers and Land Surveyors. A copy of the document is included with our Pre-Inspection Agreement which can be found under the "Client Tools" section above. More information on state requirements can be found here, The State of New Jersey Home Inspection Advisory Committee. Is your Home Inspector Licensed and Insured? More important then where we work are the standards of how we work and conduct our business. Congratulations again if your considering the purchase or sale of a home in the state of New Jersey! This state is, by far, the standard by which EVERY state in the country has tried emulate in there licensing of qualified home inspectors. Please remember that when considering the services of ANY home inspector, first check that they are a licensed professional FULL TIME home inspector, (which in New Jersey also means they carry a minimum Errors and Omissions insurance policy of $500,000, have completed 300 hours of formal education and Mentoring and have passed the National Home Inspectors Exam®). You can verify the status of a licensed inspector by following this link provided by the State of New Jersey Division of Consumer Affairs. Of course we meet those standards and exceed them. We have also chosen to be members of N.A.C.H.I., National Association of Certified Home Inspectors, which has strict membership standards and annual continuing education requirements. 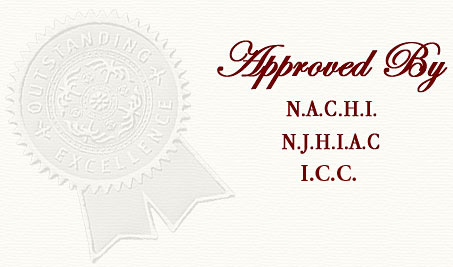 We also hold certificates from the State of New Jersey as Certified RCS (1 & 2 Family Dwellings) construction inspection professionals. Interspec, LLC is a locally owned and operated property inspection company that provides personal service to our customers, not a franchised business answering to the corporate office. We feel this gives us advantages in customizing are services to your individual needs. We know you’re very busy, so have a look around and give us a call with any questions that you may have. You can see for yourself what separates us from the pack at our "What We Do" section of this web site where you can download our official Inspection Brochure and a sample of our Professional Home Inspection Report. Interspec, LLC provides Home Inspections in all of Atlantic County and Cape May County, Lower Ocean County, Cumberland County, Gloucester County, Camden County and Burlington County New Jersey including: Atlantic City NJ-08401, Ventnor NJ-08406, Margate NJ-08402, Longport NJ-08403, Somers Point NJ-08244, Northfield NJ-08225, Linwood NJ-08221, Brigantine NJ-08203, Egg Harbor Township NJ (EHT)-08234, Galloway NJ-08205, Mays Landing NJ-08330, Absecon NJ-08201, Ocean City NJ-08226, Avalon NJ-08202, Stone Harbor NJ-08247, Cape May NJ-08212, Sea Isle City NJ-08243, Strathmere NJ-08248, Wildwood NJ-08260, North Wildwood NJ-08260, Marmora NJ-08223, Seaville NJ-08230, Beesleys Point NJ-08223, Cape May Court House NJ-08210, Woodbine NJ-08270, Rio Grande NJ-08242, North Cape May NJ-08204, Wildwood Crest NJ...and more. Copyright © 2005-2016 Interspec, LLC.